Some have predicted that the days of on-premise, desktop software are numbered as buzz about “The Cloud” and web-based applications gets louder throughout the business world. Intuit, a leader in small business software, has responded to this trend in a number of impressive ways. Intuit’s most obvious move has been creating online versions of their QuickBooks software to compete with other web-based bookkeeping apps. Although not as feature-rich and flexible as the desktop counterparts, these online versions offer a few unique features, such as a “Company Scorecard” that compares your company’s financials to other businesses in your industry, as well as a 30-day free trial. With such a large investment in the desktop software over the past thirteen years, Intuit isn’t going to ditch any of their QuickBooks products in the near future. One thing Intuit has done to fortify QuickBooks desktop software was to create the Intuit App Center, which allows businesses to expand the feature set of their bookkeeping software by adding specialized applications a la carte. The App Center currently contains 60 apps for QuickBooks Desktop software, 21 for QuickBooks Online, and more to come in the future. You can even send the App Center a wish list of ideas for apps that would make your business run more efficiently. While researching QuickBooks, I’ve found only a few customers who were disappointed with their QuickBooks software because of the lack of specialized features. After comparing their complaints to the software in the Intuit App Center, it seems like all of the problems can be solved by at least one, if not several, of these applications. There are all sorts of QuickBooks add-ons, from advanced inventory management and job costing to postcard services for direct mailing campaigns. 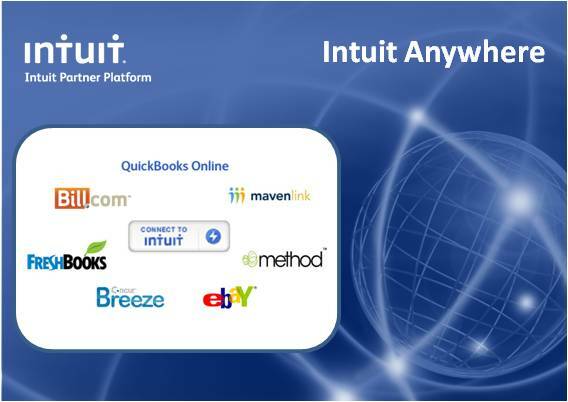 The third, and most recent, addition to the Intuit universe is the ground-breaking Intuit Anywhere platform. In the press release, Intuit describes this new program as “a set of widgets and data services that make it easier than ever for developers to offer their customers a seamless, secure and personalized experience between QuickBooks and the apps they use to run their small businesses.” With Intuit Anywhere, application developers now have the ability to add a widget that allows users to log in with their Intuit ID, instead of creating a unique log-in for every app. This not only makes individual apps more attractive to those who already have an Intuit ID, it simplifies the way developers create apps since they can just use the Intuit Anywhere log-in widget to replace the development of an account creation system. By adding Intuit Anywhere, it seems like Intuit is really trying to become the Facebook of small business. Just like some websites and applications that let you connect through your Facebook account, Intuit Anywhere makes this a reality for business websites and apps with the Intuit ID. Even though this platform is still in the Beta phase of testing, there are already several companies using the Intuit Anywhere technology to improve their performance including eBay, Bill.com, FreshBooks, and others. Although it is true that the world will see a lot more web-based applications and less on-premise software in the months and years to come, there are some features like the safety and permanence of desktop software that users will not give up anytime soon. For this reason, I believe the future of business software is more of a hybrid model of the two, like what Intuit has established with the App Center and Intuit Anywhere. We are running QB 2012. Quickbooks wants us to sign up for their QB Anywhere Apps and basically shuts down our software for several minutes while we try to figure out a way to get the irritating message to let us have control of our computer back. We are considering other software options because of this. We do not want to have anything to do with having any of our records “in the clouds”. Others must feel the same. Shame on Quickbooks.